College basketball has been crazy this year with upsets of top-ranked teams and parity across the nation. I think things will cool off some and there will be more chalk this year. 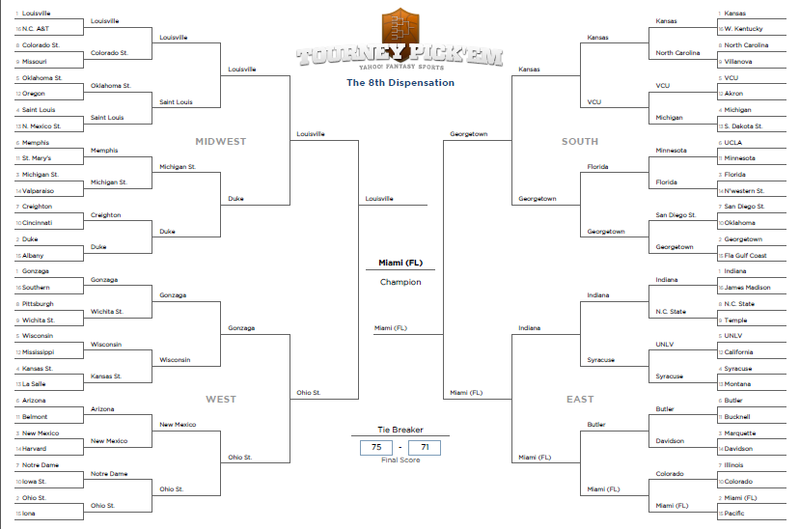 I’m picking a few upsets in the early rounds, but most of my upsets involve the #2 seed defeating the #1 seed to get to the Final Four. I think at least a half-dozen teams are talented enough to win it all. My nod to the craziness of the season is to pick a football school with no real history of basketball success to win it all! Coach Jim Larranaga took George Mason to the Final Four in 2006; this year he takes Miami (FL) all the way!